Background: Medical research is a very costly affair and of prime importance for the expansion of knowledge and discoveries of new medical treatments and cures. As a matter of fact a significant amount of medical research in hospitals is conducted on already stored patient data and often useful in devising better treatment modalities as well as in making policy suggestions. Keeping in view the tragedies in clinical trials such as Nazi experiments, thalidomide tragedy, etc, the ethical considerations in research are being given top priority. Hence it is very important to develop tools that can cut the cost of research without compromising research and medical ethics. Objective: This study was designed to develop a tool to cut research cost in resource compromised research institutions. The tool is a general informed consent form that will take blanket permission from each patient for usage of the data related to him at any specified time by hospital/institution. The study entails to evaluate the acceptance and rejection rate of this concept. Methods: The study was carried out on 1600 OPD patients. A general consent form was introduced at OPD/IPD level with permission from hospital authorities. This was an approach to consent whereby participants agree that they understand the unknown aspects of future use, trust the governance procedures, and express a desire for their samples/medical reports/pathological reports/ medical history etc. to be used for the maximal benefit of the research endeavor. 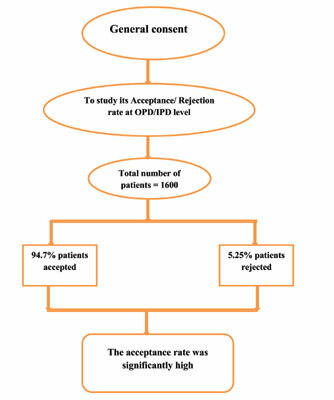 Results: The results of acceptance rate of general consent found that out of 1600 patient only 84 (5.25%) patients said no to give general consent and 94.75% of participants agreed to give the general consent for future research. The acceptance rate was higher in educated patients as compared to uneducated patients. The acceptance rate increased with the qualification. Conclusion: From the study it can be concluded that this general consent form if introduced at OPD level will not only enable research institutions to follow ethical principal but also cut the cost of medical research. Keywords: Retrospective studies, general consent, resource compromised institutions, nazi experiments, thalidomide tragedy, ethical principal. Keywords:Retrospective studies, general consent, resource compromised institutions, nazi experiments, thalidomide tragedy, ethical principal. Abstract:Background: Medical research is a very costly affair and of prime importance for the expansion of knowledge and discoveries of new medical treatments and cures. As a matter of fact a significant amount of medical research in hospitals is conducted on already stored patient data and often useful in devising better treatment modalities as well as in making policy suggestions. Keeping in view the tragedies in clinical trials such as Nazi experiments, thalidomide tragedy, etc, the ethical considerations in research are being given top priority. Hence it is very important to develop tools that can cut the cost of research without compromising research and medical ethics.